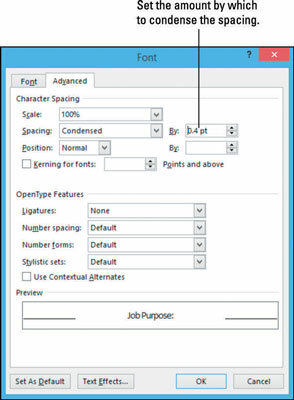 In Word 2013, character spacing refers to the spacing between individual characters, and also secondarily to a character’s individual vertical positioning, such as with superscript and subscript. Text scale and spacing changes can help you fit your text into an available space by subtly changing the spacing between each letter. It may not be obvious to your reader that you’ve made such a change, but the overall effect is to increase or decrease the amount of space that text occupies on the page. The Scale setting controls the width of each character. Changing the scale makes the characters wider or narrower in relation to their height. For example, you can see the same text at 80-, 100-, and 150-percent scaling. The 150-percent version looks like it’s taller than the others, but that’s an optical illusion; they’re actually all the same height — only the width changes. The Spacing setting controls the blank space between letters. For example, the following shows the same text with different amounts of spacing. Condensed spacing jams the letters together; expanded spacing spreads them out. These examples are dramatic to show the differences more clearly, but in most documents, an adjustment of one point or less may be sufficient. In Word 2013, open a document in which you want to adjust character spacing for your document to fit onto one page. Select all the text at the bottom of the page that doesn’t quite fit. On the Home tab, click the dialog box launcher in the Font group (. 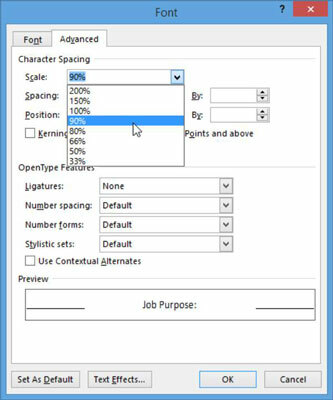 In the Font dialog box, click the Advanced tab; from the Scale drop-down list, choose 90%, and then click OK.
Scroll to the bottom of the page to see whether the text all fits on one page now, and then click the dialog box launcher for the Font group to reopen the Font dialog box. From the Scale drop-down list, choose 100% to restore the text’s original spacing; from the Spacing drop-down list, choose Condensed; in the By box next to Spacing, click the up arrow to set the amount of condensing to 0.4 point, and then click OK.
You’d think that clicking the up arrow would increase the amount of the setting, but because it’s condensing the text, a smaller number makes it less condensed. So the number goes down as you click the up arrow. Scroll again to the bottom of the document and notice that the text fits on one page.